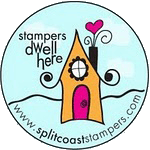 I am so excited to tell you that Sharon Johnson (aka notimetostamp on SCS) selected li'l ol me to be her Stamp Simply guest designer for the month of September! 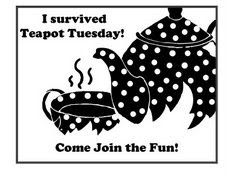 As most of you probably know, each Friday Sharon posts a Stamp Simply challenge on her blog. And, if you don't know about them, why not hop on over and check out her challenges. I have to admit that I'm a little intimidated presenting "my stuff" with this uber talented design team, but I am so thrilled to have been asked! Thanks, Sharon! And, if you've followed my blog for a while, you know that Sharon and I have met in person on a few occasions...most recently at the end of July for a Michigan stamping event, which was so much fun! Sharon brought a lot of her goodies from her Stamp Simply store for us to purchase, and I bought some of her May Arts silk ribbon (this stuff is so exquisite!!! ), the Bow Easy, and my first Just Rite stamps. She also hosted a small luncheon for a couple of us who had traveled a long way to the event----scrumpdillyicious!!!! Sharon is a wonderful cook and hostess, in addition to being one of the most talented stampers I've ever met. But I digress and should get back to the task at hand. Sharon's Stamp Simply #103 challenge this week is to stamp your sentiment over your image! I love the simple elegance of this stamp in Stampin' Up's God's Beauty set. I stamped it in Tuxedo Memento Black ink and watercolored it with SU reinkers. After that dried, I added a few touches to the leaves with my So Saffron marker and a little white gel highlighting. After I stamped the sentiment, I stamped the Floral background in River Rock, which I find to be a wonderful complement to Old Olive. I punched two opposing corners on the black matting with my square steps punch and the other two opposing corners, I added black brads. Last I added the scoring to the Old Olive base panel with my ScorPal. Please be sure to stop by and see the spectacular creations of Sharon's super talented design team members for this challenge. I'm sure they'd love your visit and your comments! And, of course, the leader of the pack, Miss Sharon herself! Oh my goodness, how very STUNNING is this!!! I have always loved that floral background and have gotten tons of use out of mine, but honestly, it has NEVER looked this good -- what a GREAT color combo, for sure!!! 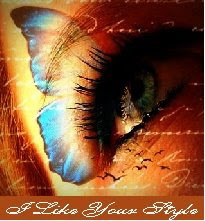 Love your image and sentiment! Way to go!!! And welcome to the pack!!! Many congratulations to lil ol you being chosen ...are you kidding me?? Your talent overflows,, Charlene, and your designs always inspire!! What an asset you'll be to Sharon's design team! Way to go!! Oh, and your card is lovely combining two very different stamps to create a very beautiful look! I absolutely adore your take on this week's challenge. What an exquisite design! Charlene this is just gorgeous!! Great job with this challenge!! Well lil ole you created a great card. Congratulations. Sharon has great taste in her choices...I really like this background and need to use it more. Very elegant card. I also am in love with the May Arts ribbon...Have a great weekend. Just gorgeous Charlene! I love your color choices, and that single stem over the floral background--wowzers! So fun to have you playing with us this month! Oooooo! This is so pretty! Beautiful card, Charlene! I always loved that Floral background stamp, and it looks stunning here on your card! Welcome to the Stamp Simply team! Congratulations, Charlene. I will look forward to your beautiful cards here on these challenges. This is a great one and I love how you stamped onto design paper. Beautiful Charlene! I like all the *space* wonderfully done. Congrats on the Sept. spot! Absolutely gorgeous Charlene! I'm so looking forward to seeing your creations on the SS challenges throughout September! Congrats on being Guest Designer!! This card is really beautiful, Charlene! TFS! And congratulations on being chosen to stamp for sharon's team.....she couldn't have chosen better!! fabulous!!! love this- and welcome welcome! this card is lovely - wonderful bg stamping and I love the verse over the stem - very nice!!! have a great long weekend GF!! 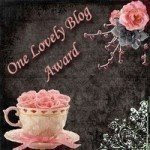 Your card is just stunning, Charlene!! Big congrats to you...so well deserved!! you may have stamped simply, but you have created an uber gorgeous card, my dear friend.....and...Sharon knows a fellow stamping genius when she sees one....Congrats, cutie!!! Just gorgeous, Charlene. I love that background and the single leaf as the focal point is stunning. Welcome to the team!!! Beautifully done, I love that background stamp -- may have to pull it out after seeing you card! Thrilled to have you this month with SS!!!! Hmmm.. strangely I find myself craving some m&m's!!!! wooohooo congrats my friend! You are awesome....and love your beautiful card too! Charlenen you are way too funny!!! Why wouldn't Sharon want you to be a guest designer?? You do fabulous work and this card is no exception!! I love the color on the leaves against the soft background! What a unique and creative card! Very nicely done!